I am sure that it will come as no surprise to you if you have visited my blog before that this is another MAC review. I have been using and loving MAC for so many years and I am very loyal to the brand. I feel like it isn’t very often that you find a brand that just seems to work for you. I know that the whole MAC phase is kind of a thing of the past and people are now moving on to try more by the likes of Tarte and Too Faced, but for me the basics by a brand like MAC are where it's at. I have tried pretty much everything the MAC have to offer over the years due to being a freelance makeup artist and everything has been of a really high quality. This was a product that I had never actually heard of before and one that I was very excited to see. I was watching a Jaclyn Hill makeup tutorial over on YouTube one day and I saw her mention these MAC Shaping Powders and I knew that I had to try them. I looked into these a little and found out that they were a MAC Pro item, so you could only order them over the phone or in a MAC Pro store. Even though I am a MAC Pro member, I live miles away from the nearest Pro store, so in the end I called them up and placed my order for three of their shaping powders that I thought would suit me the best. In the end, I bought three of their Shaping Powders which are for highlighting and brightening, three of their sculpting powders for contouring with and a pro palette so that I can encase them all together. I had wanted a highlighting and contouring palette for a really long time and I had been eyeing up the Kat Von D Shade and Light Palette because everybody seems to adore it, but I didn’t think all of the shades would work for me and I hate it when you get a palette, fall in love with one shade and then have to repurchase a palette every time I start to run low! 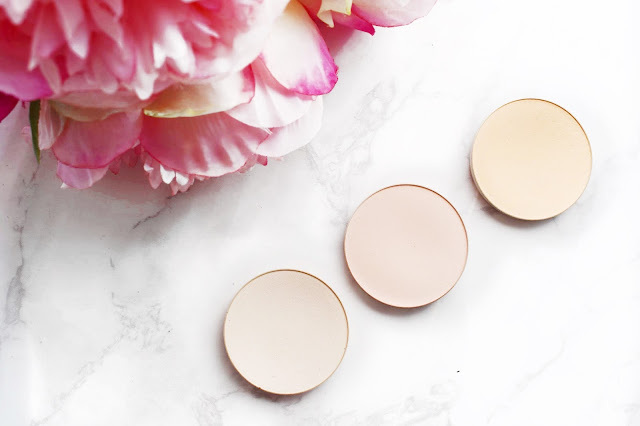 The three shades in the Shaping Powders that I bought are Soft Focus, Accentuate and Emphasise. All of the shades are ever so slightly different, but they all do the same job of brightening the face. Accentuate is a light pink/peach kind of colour which is great for if you have darkness underneath your eyes that you want to try and hide. Soft Focus is a yellow based powder which is great for brightening the area underneath the eye. Lastly, I have Emphasise which is a light white powder with a pearl shine running through it, I use this when I want my under eyes to look perfected and like porcelain when I am going full glam. The reason why I wanted to mention these powders in a review of their own is because the quality of them is just beautiful. I would say that as a whole the powders are quite sheer, but when you lay them on your face, they do the job that they are intended to do. They lighten, brighten and not only they sit on the skin really comfortably and beautifully. I never see any creasing in my fine lines with this and they lay on top of a whole variety of products really nicely. I have also gone in a little heavy with these on the odd occasion where I have got a little carried away with myself and they blend in really nicely. My favourite way to apply these powders is by laying down my foundation and concealer as normal and then I will take my Real Techniques Setting Brush and load it up with one of these powders and then pat it into the skin to mattify and brighten the area. When I use this to set my concealer I find that it is locked in place all day long and looks perfected, I don’t have to worry about my skin feeling tacky or the concealer moving around on the skin. I don’t think that these were intended to set creams and liquid into place, but they do a bloody good job at it! There is no need for me to ramble on anymore. I really love these powders and I know that they are going to be part of my daily makeup routine for a very long time. I actually think that you can now purchase MAC Pro products online, so be sure to check them out. I will leave a link to these down below in case you want to check them out for yourself. Make sure to leave me a comment and let me know if you have tried these out or if they are something you would like to try!